Idaho State Police investigators says it appears 18-year-old Holden Falk was reading a text message when he drove his SUV into an Ada County Sheriff’s Office patrol car on Idaho 44 in Star Wednesday night. Falk will be cited for inattentive driving in connection with the crash, ISP officials said Thursday. Sergeant Mike Fratusco, who was driving the patrol car, is OK.
Fratsuco was treated at a local hospital late Wednesday and released. He was back to work on Thursday. His patrol car, however, was not. It was badly damaged in the crash. Falk was driving a 2001 Ford Explorer eastbound on Idaho 44 just before 9 p.m. when he drove into the westbound lanes. 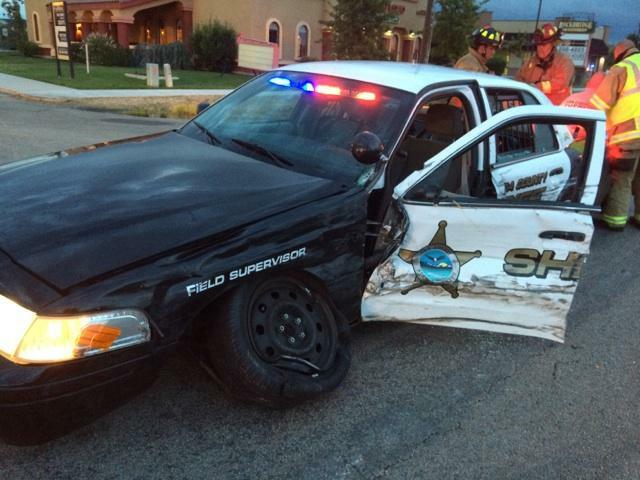 The Explorer smashed into Fratusco’s patrol car. Falk later told ISP investigators he was reading a text message he just received when the SUV went into the westbound lanes.